The NonProfitSites™ Content Management System (CMS) can be integrated with any design. We can work with your designer or you can choose a pre-existing template from the following templates. These are templates from a large template design website, so please be aware that we are not the original designers of the templates you see below nor do we endorse any specific type of template. They are here for you to review at your convenience and to highlight the fact that we can work with just about any design you like. You can view different categories by using the Category pull-down box at the top right side of this page. There are thousands of different templates to choose from. Please Note: The content shown on the templates is for demonstration purposes only. 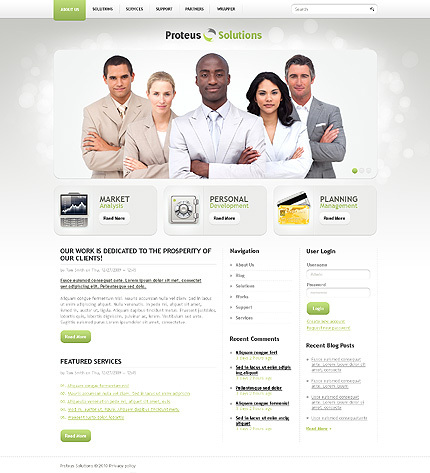 Actual implementation of the design into the NonProfitSites CMS may require modifications to the design you choose. Additional costs may apply if you have NonProfitSites add your content to the site and for any Flash integration or modification. Item Number: When selecting your template, be sure to write down the Item Number of the template to give to your NonProfitSites Sales Representative.